Here we are! We Charted in March 1973. 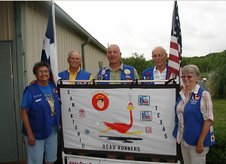 The Road Runners chapter consists of members from central Texas and beyond. See member list for individual member cities. Most members are retired ages 50 to 70 plus years young. We meet the second full weekend of each month except January and August. In December we meet the first weekend. See schedule for dates, places, and hosts. Hosts provide breakfast at 8am. Business meeting follows breakfast. Hosts provide light breakfast and fellowship at 8am. Everyone helps hosts clean up. Hook up and safe travel. 1. Free Time: might be card games, golf, fishing, reading, resting, or visiting area attractions. 2. Wagon Master will make reservations. If you wish to come early or stay late notify RV park to extend reservations. 3. The hosts will determine meal menu to be printed in the news letter. Meals may be pot luck, faviorite area resturant, or provided by hosts.